"The process of becoming a mermaid was quite indirect," says Linden Wolbert, a Los Angeles- based real-life mermaid. An avid swimmer since the age of 3, Wolbert fondly remembers the first time her parents enrolled her in a swimming class. " My first memories of water circulate around dreaming I was on the crew of Jacques Yves Cousteau's Calypso and pretending I was a mermaid by kicking with my feet together." Wolbert took to the water just like a fish and spent the rest of her time, from age 3 onward, following in her family's footsteps as a competitive swimmer. When Wolbert arrived at Emerson College to study Film and Science she stopped competitive swimming because her school lacked a swim team, but still remained close to the water, learning new skills such as scuba diving. Wolbert moved across the country to complete her film and science degree and was then hired as residence director at Emerson College's L.A. campus. "I was on-call 24 hours a day for the students and worked in an office from 9-to 5 during the week. I did underwater film shoots on the side and dived whenever possible. It became clear that I should leave my job when all I did was think about being underwater, or my next dive," Wolbert recalls. Armed with nothing more than a dream and a true love of everything H2O, Wolbert took the plunge in 2005 and set out on her own to pursue her dreams in the water, which, unbeknown to her at the time, would lead to a career as a full-time mermaid. First, Wolbert became a Professional Association of Dive Instructors (PADI) open water diver and was offered a job to be a PADI SCUBA model. Around the same time, Wolbert began to learn about a sport called freediving, or breath-hold diving, in which one dives for depth and distance. In 2004 Thom Shouse came into the picture. Shouse is a world-renowned mermaid tail specialist, and was responsible for fashioning the mermaid tail that Wolbert sported in some of her photo shoots. Friends began calling her "mermaid" because she was always in the water -- and once Wolbert got a taste of what life was like underwater, wearing one of Shouse's custom-made mermaid tails, she knew what she had to do. 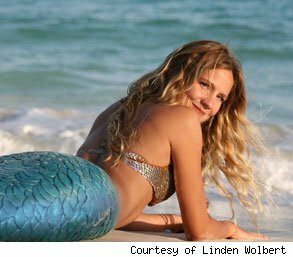 In 2006, Wolbert committed to starting her own business and becoming a professional mermaid. "I decided to pursue making my own custom tail since I loved being a mermaid so much and it came so naturally to me. I yearned to create a unique design myself," she says. Being a professional mermaid is a lot harder and more intense than you may think. First of all, there is no professional school or organization out there to teach you to become a mermaid, or to provide you with a business plan or model to follow. Second, the task of creating a tail that is both functional and aesthetically pleasing is "daunting" as Wolbert says: " Do not be fooled... making a realistic and functional mermaid tail is no easy task. In fact, it was one of the most difficult and painstaking things I have ever done. I changed day by day. It is the most expensive thing I own," Wolbert says. 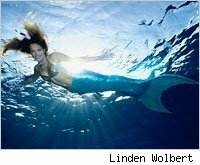 Last, there is an enormous amount of skill that is required in order for the mermaid to be able to swim underwater for extended periods of time and to certain depths, especially with a tail that weighs 35 pounds. After seven months of trial and error, Wolbert and Allan Holt, a Hollywood special effects artist and fellow diver friend, were able to fashion a 35-pound tail made of a high-grade silicone material for Wolbert. The tail also has a professional monofin built into the fluke for propulsion. "it is neutrally buoyant in the water, so it is truly meant to be in the ocean, and is a remarkable piece of equipment designed for speed and beauty," Wolbert says. Between running her own company, Mermaids in Motion, doing volunteer work (Mermaids in Motion has teamed up with 10 charities in the past several years, including: Susan G. Komen For the Cure, Dive For A Cure, Swim To Empower, and Project GrrL), doing breath-hold training and photo shoots, Wolbert still finds time to work on her list of career goals. "When I'm not performing or planning a job or shoot, I am constantly spending time researching new ideas, training to improve my water skills, maintaining my mermaid tails, freediving, scuba diving and yeah -- sitting in front of my laptop for hours on end responding to clients and colleagues." As if Wolbert's schedule isn't already packed like a can of sardines, she is also an international freediving judge for The International Association for the Development of Apnea (AIDA), judging some of the best freedivers in the ocean at competitions. She travels much of the year to perform as a mermaid for large-scale events and shoots around the globe. For now this fish is happiest in the water and especially when she gets to work with children and spread her love of the ocean to others. "I have a list of goals that I am always striving toward. Primarily, to reach as many children as possible through my line of work; encouraging them to experience the ocean for themselves, fall in love with it, and conserve it. I am certain that by reaching the imaginative and open minds of children, we are changing the way humans will impact our oceans in the future." For those other water-loving merpeople out there, unfortunately Mermaids in Motion is not hiring -- but Wolbert encourages other swimmers and ocean-lovers to follow their dreams just as she did. "Anything is possible if you truly believe in it... we each have our own unique path that brings us to our personal success. I just follow what makes me happiest. I pursue it with all of the energy I have and it feeds me every day."